Opinion: given the impasse around Brexit and the border, is it time to contemplate a new constitutional conversation about Irish unity? The discussion of Irish unity is gaining momentum. Brexit has fundamentally altered the nature of this conversation, as more people now reflect on the constitutional future. The debate is happening and has been ongoing for some time. That does not mean Irish unity is any closer; it simply suggests a willingness to contemplate this option and then to think through the implications. The intention here is to offer reflections on this evolving dialogue. First, there is a need to bring civility, and some measure of calm, to the conversation. The idea of referendums on the island of Ireland is embedded in the Good Friday Agreement and reflected in domestic and international law. It is the result of a democratically endorsed constitutional compromise that is intended to underpin relationships on this island and across these islands. The adopted formula is complex but it should not be a source of contention. The tendency to lambast those raising it reflects understandable party-political divisions and intense pressures over Brexit. However, the language of utter rejection could sensibly be avoided as part of a "de-dramatisation" project. There is really no need for terms such as "inflammatory", "dangerous", "toxic", "divisive" and "destructive" in response to those asking self-evident questions about existing constitutional guarantees. Are people supposed to pretend that there is not an anticipated and agreed solution to a hard border on the island (the solution that dare not speak its name)? For example, Irish citizens in Northern Ireland will point to the near constant references to "strengthening our precious union" and the UK government’s actions in repeatedly undermining the doctrine of "rigorous impartiality". A detailed grasp of Irish history is not required to accept that there is something troubling about the notion that it is "dangerous" to test the principle of consent. A relaxed and open discussion should be possible. Second, the pathway to these referendums poses several questions. The Good Friday Agreement sets out the requirements and these are largely reflected in domestic law. The Secretary of State for Northern Ireland has a central role and significant discretion to call a referendum at any time and for any reason. Where this shifts into the realm of duty is when it "appears likely … that a majority of those voting would express a wish that Northern Ireland should cease to be part of the United Kingdom and form part of a united Ireland". The High Court judgment of Lord Justice Paul Girvan in the McCord case has provided further clarity around the nature of these powers. From RTÉ 1's Claire Byrne Live, do we want a United Ireland and how much would we be prepared to pay to sustain it? Much of this is self-explanatory and can be understood by reading the legislation. But the rationale underpinning it should be spelled out. Once it appears that a voting majority might prefer a united Ireland then the "sovereignty arrangements" here begin to have a de facto illegitimate quality. If constitutional status rests on ongoing consent (and there are still plenty of people in the region who doubt that), then once it appears that it may be absent this region is in radically new political territory. That is why it is essential that consent be tested in that context. This is one reason why, looking at polling evidence. it is reasonable to raise the no-deal Brexit scenario as a basis for assessing the levels of consent. Of course, there are other considerations in play, but it would arguably be a dereliction of political duty in the current context not to at least mention it. Party political competition should not encourage any further erosion of the fundamentals of a peace process that is already at risk. From RTÉ Radio 1's Drivetime, a report on the 2017 Joint Oireachtas Committee report on the impact of Brexit on Ireland and the means by which a United Ireland could be peacefully achieved. Third, no one wants to be forced into rushed referendums on this island based on inadequate information and there should be careful planning within an appropriate timeframe. Too often, however, this argument is deployed as an excuse for inaction; unity as a hazy aspiration for a mythical future that never arrives. Responsibility must be taken for co-ordination of a coherent approach and that should fall to the Irish government. That is not to promote a top-down or exclusionary model, but it does suggest that such work requires government-level resourcing and support. The more revealing conversations may well happen elsewhere, particularly within community-led initiatives that aim to conceive of this island as a shared space. The scale of misunderstanding on this island is immense and it will only be, as ever, community-led courage that will begin to thaw relationships between people. And remember: it is this intense focus on people that will be essential. Fourth, there will be many complex and difficult practical challenges of absorbing this region into an existing state. These can be exaggerated, as can the impact of reunification. However, the opportunity should not be missed to reflect on the human rights, equality and identity aspects of the constitutional architecture. In building a persuasive case for unity amongst the unionist community, for example, there would be merit in offering enhanced guarantees on rights, equality and identity. Concerns that people have over socio-economic status could be met by discussing more robust protections. The opportunity should not be lost to consider what assurances might be needed and what sort of "new Ireland" this would be. Will this be a project of radical transformation or an exercise in conservative stabilisation? And finally, although unity is plainly not at the top of the Irish Government’s priority list at the moment, it is arguably in the longer-term strategic interests of the Irish state in a post-Brexit world. The Irish government has a formidable incentive to ensure alignment on this island for its own purposes. That is one reason for its effective and impressive approach to the EU-UK negotiations, and why it needs the Withdrawal Agreement and future relationship negotiations to succeed. Successive governments have sought, and will continue to seek, to contain this region and conserve the existing arrangements. This place remains the abandoned reminder of past sins of British-Irish relations. There are pragmatic and principled reasons for doing so and it would be silly to ignore the scale of anxiety about potential unity and its implications. There will be equally fierce resistance to this discussion in the south: "official Ireland" does not want to have this conversation and those raising it know the consequences. There is considerable merit in the constitutionally recognised centrality of uniting people, and that will always remain a project based on persuasion (both ways, of course). However, what Brexit will do – particularly if the UK drifts ever further away from the EU – is incentivise unity in hard strategic and geopolitical terms. The obvious way to shield Ireland from the risks of a hardening border and the subsequent damage to its own reputation within the EU, is to absorb this relatively small region. Many will see that as a provocative statement (no one doubts the work to be done), but it does have a logical quality. 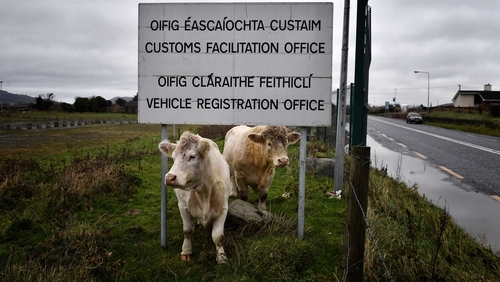 In the longer term, it may well be in the selfish and strategic interests of the Irish state to render the border on this island permanently invisible (through the accepted mechanisms), rather than continue to rely on the politics of selective containment.